The use of assemblage as an approach to making art goes back to Pablo Picasso’s cubist constructions, the three dimensional works he began to make from 1912. An early example is his Still Life 1914 which is made from scraps of wood and a length of tablecloth fringing, glued together and painted. Picasso continued to use assemblage intermittently throughout his career. In 1918 dada artist Kurt Schwitters began to use scavenged scrap materials to create collages and assemblages – he called this technique ‘merz’. Assemblage also became the basis for many surrealist objects. Inspired by psychologist Sigmund Freud’s writings about the unconscious and dreams, surrealist artists often combined unlikely combinations of found objects to create surprising and unsettling sculptures. In the 1950s and 1960s assemblage became widely used. 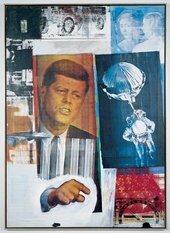 Artists Jasper Johns and Robert Rauschenberg adopted an apparently anti-aesthetic approach to making art. They used scrappy materials and found objects alongside messily applied paint to create expressionist reliefs and sculptures, earning them the name neo-dada. Artists of the Italian arte povera movement, such as Mario Merz, made artworks using an assemblage of throwaway natural and everyday materials including, soil, rags and twigs. Their aim was to challenge and disrupt the values of the commercialised contemporary gallery system. As a technique assemblage continues to be extensively used, for example in sculptures of YBA artists such as Sarah Lucas, Damien Hirst and Jake and Dinos Chapman. Many contemporary artists, such as Tomoko Takahashi, Christina Mackie and Mike Nelson, create large-scale installations from assembled, scavenged materials and found objects.